We all know very well that the tech giant Google has a habit of trying to meet the application needs of its Android ecosystem. Now, according to the latest reports, the tech giant Google just launched its new security system for its Android devices. The tech giant Google just introduced Adiantum, its new encryption that will be available for the low-end devices. The idea of the company, of course, the tech giant Google is to offer protection for everyone, including those who do not have a high-performance smartphone. The all-new security form of the tech giant Google, of course, I am talking about none other than the Adiantum basically comes as an alternative to the AES (Advanced Encryption Standard), an encryption standard found in mid-range and high-end smartphones with ARMv8 processors. The problem for the low range is that these devices do not always have a processor compatible with AES (Advanced Encryption Standard), which affects the user experience since the smartphone simply becomes extremely slow. While now the new security system, of the tech giant Google, of course, Adiantum is based on the ChaCha20 stream cipher and takes some characteristics of AES as well. As the performance tests on a smartphone with a Cortex-A7 chip at a clock speed of 1.19GHz are really captivating. 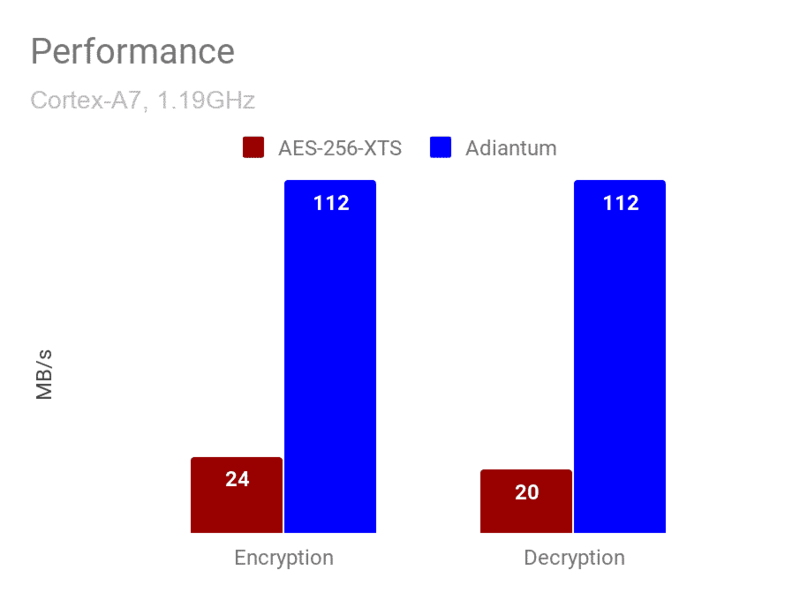 While the new security standard of the tech giant Google, of course, Adiantum performs five times faster than AES-256-XTS encryption maintaining its security level. Hence, with the new security standard Adiantum, the tech giant Google thinks about the smartphones that are distributed in emerging countries. A couple of years ago the tech giant Google committed to this market by announcing its third version of Android OS, of course, the Android Go. The all-new new Android Go is basically designed for low-end smartphones, as it consumes much less resources and has its own version of optimized applications as well. Hence, encryption for the smartphones with Android Go is more than welcome. Moreover, the best thing is that this new security system will not be focused solely on smartphones only, but also available on TVs with Android TV and watches with Wear OS. So, what do you think about this? Simply share all your views and thoughts in the comment section below.